If you think all fabric buildings are the same, think again. Meet Calhoun Super Structure, the Canadian, family-owned company with over two decades of manufacturing and engineering expertise in the industry. Calhoun prides itself on being an innovation leader in the way it meets and exceeds industryspecific needs. Understanding that municipalities are often faced with limited budgets, Calhoun reassures its clients that it can assist with even the most complex storage needs. The Calhoun team helps customers find a naturally bright, quickly installed storage building for their fleet, equipment and goods; one that won’t break the bank. Calhoun thrives on explaining why its hot dip galvanized, steel-framed structures are a wise choice for municipalities in search of an economical storage solution. What’s more, every high-density, polyethylene-covered structure is designed and engineered specifically to the exact geographical location and its correlating weather patterns. The initial investment and operational costs are a fraction of the price of traditional wood or steel buildings: Even so, Calhoun is able to custom design a building to meet any city’s exact needs. 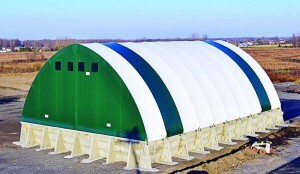 The veteran company has four series to choose from, with structures ranging in width from 32 to 200 feet. The buildings have freespan interiors, which maximize storage space and leave plenty of room for machinery and employees to move around effortlessly. That’s why Calhoun promotes itself as being the best storage solution for any type goods or commodity a person can think of. From fleet and equipment to sand and salt, or even waste and recycling, Calhoun sells structures across North America to serve that very purpose. As the company makes evident on its website, creating a safe, dependable structure is of the utmost importance to Calhoun. During the engineering and design phase, the company’s own team and third-party engineers analyze every single point of stress on all parts of a building, down to those the size of a pin head. This attention to detail leaves customers with peace of mind, knowing their personnel and equipment will be enclosed in complete safety. The fabric building company also speaks to how worker safety is improved, since fewer shadows are cast with fabric roofing. Calhoun’s HDPE covers also allow natural light to shine through, omitting the need for interior lights on sunny days. To provide the best buildings on the market, Calhoun sometimes employs a different mechanism for installing its fabric covers. On all buildings over 62 feet wide — or, if a customer with a smaller building wants to upgrade — Calhoun’s HDPE sheets are installed using a keder panel system, which is a custom-made aluminium extrusion mounted at each truss section. Keder panels prevent the fabric from touching the structure’s steel frame so the building becomes a quieter, more secure environment. This process also substantially decreases the risk of wear points on the cover. Another differentiator between Calhoun and some of its competitors is that Calhoun’s HDG process takes place after the steel is fabricated, creating a completely smooth surface that won’t snag or tear the fabric cover. All of its steel-framed buildings are HDG, which protects against rust and weathering and makes the trusses strong and dependable. Calhoun has even gone the extra mile to cater to those looking for extra protection on a structure: Its Super Shield rubberized coating spray can be applied to all trusses as well as the concrete and block wall foundation. Super Shield is resistant to most waterborne chemicals and will protect a structure against corrosive materials like salt and fertilizer. With over 1,000-pounds-per-square-inch tensile strength, it adds years of life to any structure and is UV and weather-resistant, nontoxic, noncarcinogenic and asphalt-free. The overall result is a pretty sustainable investment. Speaking of economical and sustainable products, customers often provide positive feedback on how their job sites are kept clean and minimal in size. Calhoun team members say they are proud that their product and knowledgeable dealers leave behind a relatively nonexistent environmental footprint. With over two decades of experience, Calhoun seems to have thought of everything. Unsurpassed engineering, customized and innovative designs and attention to every detail are what have helped the family-owned company become one of the most trusted in the industry. With dealers located across North America, Calhoun can provide service just about anywhere. The head office and manufacturing plants are in southern Ontario, but its products can be shipped to the most remote location. Whether you’re beating the Florida heat or gearing up for a cold, snowy Minnesota winter, Calhoun has you covered. 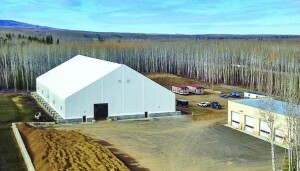 Visit its website at www.calhounsuperstructure.com to see more great photos of the multipurpose storage structures, details of their engineering and the four building series that are offered; or call toll-free (800) 265-3994 for more information. Calhoun’s strength is certainly in its structure.